Valve boss Gabe Newell stepped up to the stage during last week's BAFTA awards to receive the prestigious Academy Fellowship for his contributions to gaming. Presumably momentarily distracted by accepting a trophy modeled after a smirking face, a bewhiskered Newell fielded some interview questions over the normally airtight subject of Valve's business performance that hinted at the monumental scale of the studio's prosperity. Newell chalked up Valve's successes largely to user-generated content on open platforms such as Steam Workshop before sharing some jaw-dropping numbers. "There's sort of an insatiable demand for gaming right now," Newell said. "I think our business has grown by about 50 percent on the back of opportunities created by having these open platforms. "And just so people understand how big this sort of scale is getting, we were generating 3.5 terabits per second during the last Dota 2 update," he added. "That's about 2 percent of all the mobile- and land-based Internet activity." Wait, what ? We're not exactly sure what Newell meant when he dropped that bombshell of data info, apart from maybe claiming responsibility for all those times my connection speeds chugged while browsing these past few months. 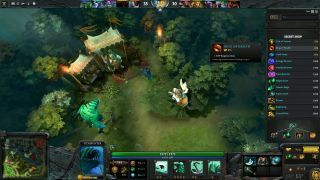 Still, it seems entirely plausible—Dota 2 has a lot of players , and the MOBA recently took the crown for the highest concurrent user amount of any Steam game ever. If any Steam game can feasibly take a bite out of the entire Internet, Dota 2 holds the best chance.